I've Got You Covered Blog Tour Hosted by @ Reading Addiction Blog Tours. I received a copy of this novel from the author as part of the blog tour for an honest review. Anistasia moves to Brooksville where she meets John. The duo hit it off almost instantly and become best friends before it grows into something more than friendship. While they blossom together they have to go through the daily routine of high school drama and jealous ex’s on John’s part and over bearing brothers on Anistasia’s part. But each struggle seems to hold the two together even more. Along with the daily high school problems they also have to deal with the mafia hunting down Anistasia, John’s mafia father, and the every other weekend street races. Running from bad guys, keeping the cops out of the know how, and trying to stay undetected is proving to be more of a handful when the only person you can trust is also on the run. Toni G. Sinns has wrote an amazing spectacular novel one which I thoroughly enjoyed reading. I was so interested in this book as soon as I read what I've Got You Covered was about I knew I'd love it and I definitely did! Page after I page my interest grew and it kept me wanting to read more and more. The characters were so well detailed and described I couldn't help but picture them which made the novel more enjoyable. I am definitely going to be reading more the authors novels in the future as this was simply brilliant! Toni Sinns was born and raised in Western North Carolina before moving to Central Florida in 2011. She is an upcoming author/writer with a mind in multiple genres of novels and books. She is currently working on multiple novels. Well I don’t want to bore you with a birth to age 24 time line so let’s jump around. I graduated with my high school diploma in the start of 2006. I graduated my local community college in 2011. It took me 4 years to get a 2 year degree because I switched majors a lot. Finally chose a Medical Office Administration with secondary Medical Billing and Coding. Then I got married to my wonderful husband in Oct. 2011. This past February I released my poetry book “Words that make Sentences that make Poems” and was pleasantly happy with the reviews. And then April I had finished book one of the Blazing Charm series and released it as well. I write because I love to write so the journey has been a great pleasure for me mostly. I did get a few shocks about cost of edits, book covers (which the guy I found is amazing and works with me and my budget), and different cost to advertise a book once it is published. But my joy to write still is strong enough to not let all that turn me away from writing. My currently published novel has actually slightly been building for a couple of years. I would write bits and pieces of it and share with my friend whom the book is dedicated to. And he would add people to interact with them. Finally last year I set down and told him I was going to make our crazy group of people into a series. A couple months later book one was finished. And book two was started. I also have a ton of other novels in progress that range all over the scale. Not exactly, I do know that it started at a very young age. I was one of those kids in elementary school that loved the writing test because it gave me a chance to write a story and see how much people liked it. I was always given a 3 or 4 on my test and it really boosted my confidence in my story telling. I would write all the time growing up. Sometimes I would write songs, poems, and in my journal. I even made full story lines for my toys when I played with them. Luckily I never gave away my creativity and joy for writing stories. I am not very set on my typical day but the most common type day I have would consist of me waking up to early from a night of going to bed too late. I get up and let the dogs and then turn on the light in the two cat rooms. Let the dogs end and continue with the daily feed the animals routine. I clean the house some, greet my husband for lunch, send him back to work and get on my laptop. On my laptop I am in about five places at one time. I write my stories, while on facebook, email, my blog, and playing a video game. Currently I’ve been playing World of Warcraft a lot. Sadly I haven’t really read that many books from 2012. My reading has really seemed to take a down fall. And I don’t seem to pick up books from new authors or new books from old authors when they release anymore. I did read a great book in the end of 2011 called “Making Waves” by Tawna Fenske. She released two in 2012 called “Getting Dumped” and “Believe it or Not” which is the one following “Making Waves” in her trilogy. I really like her stories because they are romance with action, some adventure and covered with humour. And also I like Tawna cause she is a great friend and just as funny as her books. Do have a motto when writing? Let the character choose the next move. Write, listen, observe and write some more. You can have a great story idea but can destroy it by having all cookie cutter characters. Observe everything and always have an open mind about things. Use many people to find what you want in your characters to help build the story. And write write write. There is possibly a .01% chance that the first book you write will send you to the top. It is normally the second, third, fifteenth or more. Everything takes time and not everyone will love what you write. And don’t expect to get rich. What do think of I've Got You Covered? Do you think it sounds good? What do you think of Toni's favourite books so far of 2012? Win an ecopy of I've Got You Covered using the rafflecopter below! 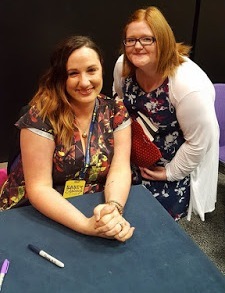 YAY So happy to hear you enjoyed the book :) Thanks for being one of my blog stops and for the interview. I enjoyed it.